Awesome work fantomas! I was curious if there would be a possibility to show the mining items without wearing the goggles because I find that to be quite tedious. Mine to an item, put goggles on to find the next one, take them off, mine again, boring. Also there is a mod that allows you to see the items from much farther away so perhaps that could be implemented as well or instead if easier. Is any way to increase player action speed (tree kick, axe, pickaxe) with cheat engine? The absolute madman Fantomas doing amazing work and making the game great for us all! Can't thank you enough, but thanks again Fantomas, ImpalaPUA, Tahtawy for everything you've done for this game so far. 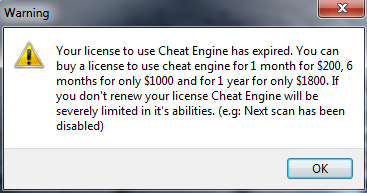 On an unappreciative note thanks for disregarding me try to help and adding "with cheat engine" on to the end of your message. Thank you for your answer about "Instant Actions" mod. Last edited by Søren on Mon Feb 04, 2019 3:51 pm, edited 1 time in total. It's "mono" in the menu at the top of the software's window. Click on it and "activate mono features". Do you know if there's a cheat to unlock kickstarter rewards? I heard it was only a matter of code in a file like "DLC=1", but I don't know if it's how it really works. DLC 1 contains only one weapon. DLC 2 contains weapon, hat, and clothing set. DLC 3 contains weapon, hat, clothing set, and pet. Last edited by Søren on Mon Feb 04, 2019 3:51 pm, edited 4 times in total.